If you thought Golden Road was ubiquitous before, you were right. You’ve been able to pick up a case of the brewery’s Hefeweizen at pretty much any grocery store in the city for a few years now, most of the finer beer bars in L.A. offer one or two options on tap, and bottle shops are practically dripping with their hoppy offerings. 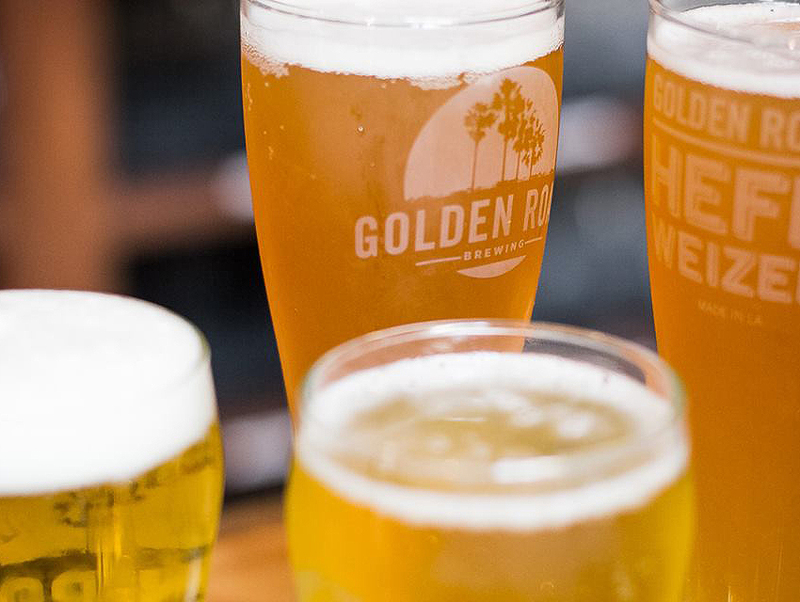 As sweeping as that sounds, Golden Road is set to gobble up even more of L.A.’s craft beer pie over the next year, even edging its way into the O.C. The brewery has started construction on a brewing outpost in Anaheim, secured space in Grand Central Market for a tasting counter, and struck a deal to open a restaurant at LAX. “We started working on these projects at different times, but they’ve all come together at pretty much the same time,” Golden Road Co-Founder Meg Gill says. The 56,000-square-foot space is Angel Stadium-adjacent and will put Victor Novak (current head brewer at the original L.A. location) to work on barrel-aged and small-batch releases.Whereas the mother ship rarely brews batches smaller than 200 barrels, the Anaheim iteration of Golden Road will brew smaller, 15-barrel batches as a rule, Gill says. Until now, the brewery has focused on fresh, hoppy offerings, but the Anaheim location will help the brewery get in on the experimental beer game. “The market has changed since we started. There is a huge demand for specialty beers now,” says Gill, adding that she hopes that will be brewing (and sipping in a small tasting room) on location by the end of the year. Walking into Grand Central Market is like walking into a gentrification snow globe—a little microcosm of what’s playing out on a larger scale Downtown. Give the place a good shake, and old stalwarts, like Sarita’s Pupuseria, mix seamlessly with new arrivals, like Eggslut, La Tostaderia, and coming soon, a Golden Road tasting counter. Starting as early as September this year, market goers will have access to twenty taps (all pouring Golden Road’s finest) and a selection of delicious pierogis (both vegan and non-vegan). Golden Road’s tasting counter will also have a growler fill station for those of you who like to drink the fresh stuff at home. Golden Road already has a major presence at LAX. You can find their beers in pretty much every terminal—Gill says that LAX represents their biggest account right now, and their airport footprint is about to expand in a major way. According to Gill, Point the Way Cafe will be a foodie and craft-driven concept restaurant in Terminal 6 (United, Alaska). The restaurant will feature Golden Road brews from both the original location and the new Anaheim outpost, plus there will even be brews specially crafted for LAX. But above having a new food and beer option at the airport, Point the Way Cafe represents something bigger for the Los Angeles beer scene, Gill says. LAX is an entry point for people trying to shape their L.A. stories—tourists, new residents, business travelers—and having a major craft beer force be part of people’s first moments in the city shows how important the craft beer scene is to Los Angeles. Expect Point the Way Cafe to open by next summer.